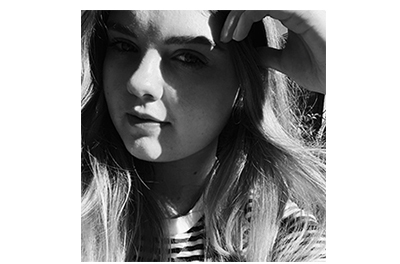 New in my Wardrobe | emma etc. One of the reasons summer isn't my favourite season is because I can't wear my beloved jumper and jeans combo (most of the time), however I'm trying to somewhat embrace warmer days by picking up a few pieces that are suitable yet still me. You can't quite prise me away from my jeans even in summer, but I do have to bring out the t-shirts and open footwear. Summer in New Zealand has come round with a vengeance, but if you live in the Northern hemisphere, I think some of these items will still work during winter. I mean, I love transitional dressing and layering, so don't tend to buy items only for summer or only for winter. My obsession with blazers continues, this time with a fancier edge. When scrolling on ASOS, I came across this gorgeous Vila Tailored Velvet Jacket. I had been on the search for another blazer so I could continue to dress like a Haim sister (in my dreams), and couldn't get this one out of my head despite it being a little more expensive. As soon as ASOS had a 20% off sale, I jumped at the chance to get some money off, and was really pleased when it arrived. I think this was quite a risky item to buy online, but something that payed off (if you ignore the creases in the photo). The blazer is pink velvet, yet from some angles it has an orangey tinge which I absolutely love, and when you roll up the sleeves you see a peek of the orange/rust coloured lining. This isn't exactly a summery purchase as I'll probably melt if I wear it often, but could be good for parties/events in the evening, or worn in autumn next year. I thought it was about time I caved and bought some summer footwear because at the moment my wardrobe is full of countless sneakers and one pair of winter boots. I think it is quite hard to find comfortable summer footwear unless you really want to invest in an expensive pair, however the Spurr Tasha Slides from The Iconic (with literally the best, quickest shipping ever) suit me fine for now. I really like the simple style of these, and of course they go with anything. One thing I will say about these is they leave black marks on my feet when I wear them for the whole day, which isn't ideal but not the end of the world. These were really cheap, especially because I got 40% off at the time. I did buy a pair of blush slides at the same time, however I returned them because they were way too small - either my feet are wide or their sizing is off! The other pair of shoes I bought recently were the Chuck Taylor All Star Hi by Converse because I absolutely love the look of them with jeans, especially when they eventually get a bit worn. Wearing these in summer is actually quite bearable, plus looks great paired with a casual t-shirt and jeans combo, because what else would I be wearing? I do have these in white, but they are so dirty and old now, I thought it was time for an upgrade. 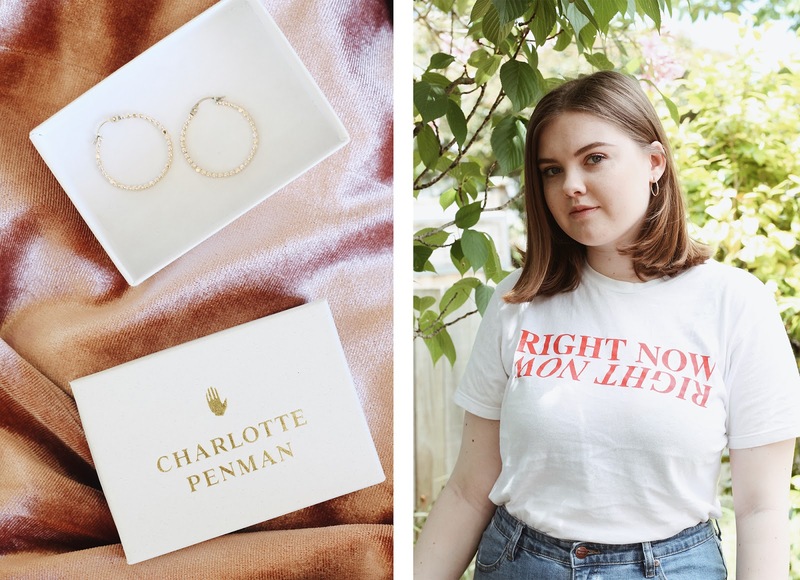 In terms of jewellery, I was lucky enough to get a few pieces for my birthday, one of them being the Charlotte Penman Tempo Hoops. These have now become an everyday piece for me - they go with absolutely anything. Gold jewellery has been a favourite as of late, although I still love wearing silver, especially when it comes to necklaces. I think everyone has had an affinity with earrings, or even statement earrings, lately and I'm in no way over this trend. As a side note, the t-shirt I'm wearing is from Haim's merch collection with Urban Outfitters. Although I got this a while ago, I thought I would include it anyway, especially considering how much I wear it. At the time it sold out so took a while to arrive, but they still have some in stock and it's now half price FYI. Although I own enough jeans, I have been on the lookout for another pair to add to my collection, specifically a pair of light wash ones. I bought some a few months back but it ended up that they were too tight - I now hate the look and feel of skinny jeans. But as I was browsing in the Auckland Dangerfield store, I came across some I really liked the look of - the Tilda Jean High Crop Flick. The fit of these is high waisted (and properly high waisted), slim on the thighs with a small flare. 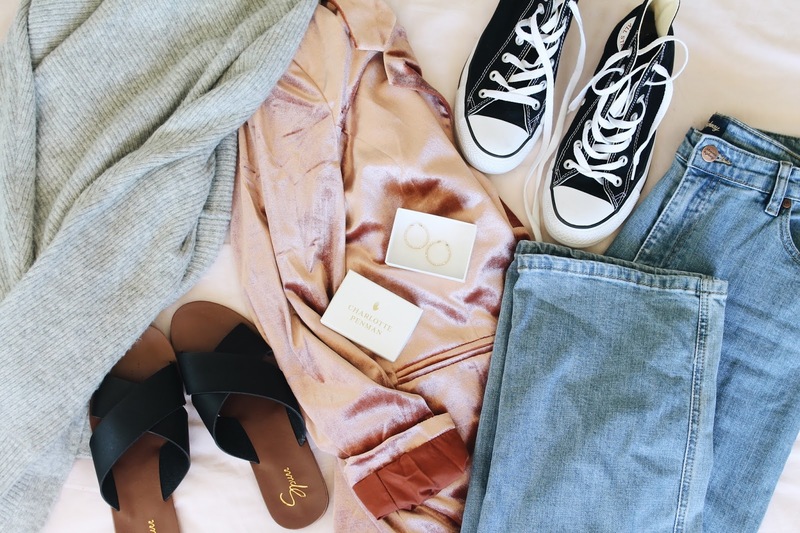 I find these type of jeans just so comfortable and they will work all year round. 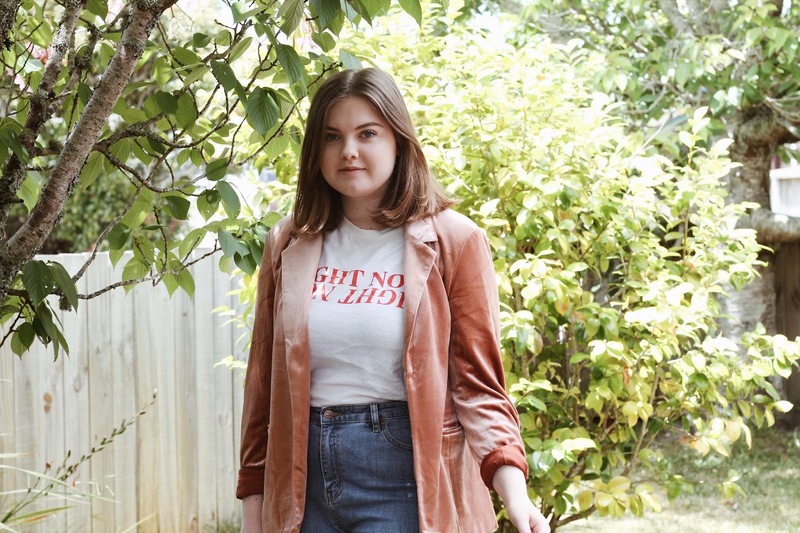 If you haven't heard of Dangerfield, they are an amazing Australian clothing brand I would describe as quite kitsch or quirky - the pieces tend to be more expensive sometimes but they have good sales. I went heart eyes for all their jumpers in store last winter, so you can bet I'll be making a bee line for their store when the time comes around. I recently bought a lovely soft grey cardigan to take me through from spring to summer, and will serve me well from summer to autumn next year. 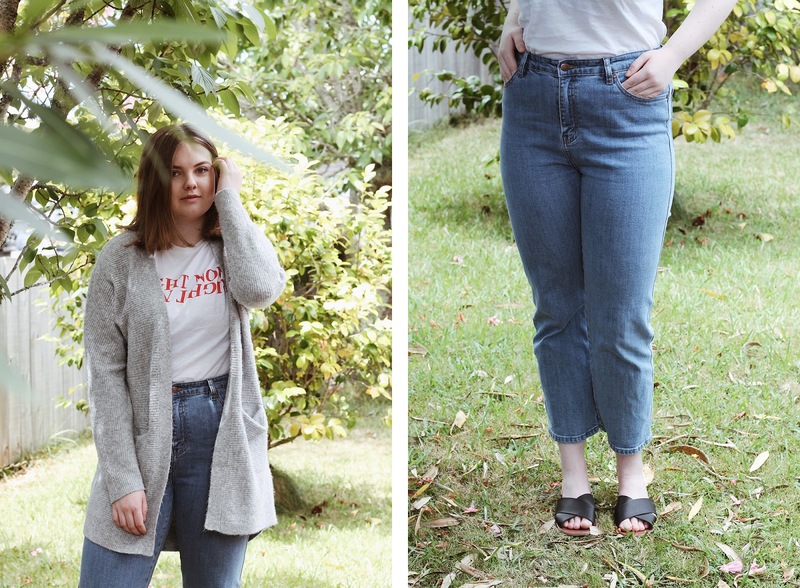 The Miss Selfridge Cocoon Oversized Cardigan from ASOS goes perfectly well with jeans and a t-shirt year round, has such a nice, relaxed fit and has big pockets. If it has pockets, I'm sold. This cardigan was a pretty good price considering how high quality it is. That's everything I've added to my wardrobe recently. I would love to know if you like any of the above items, and what you have been wearing lately during summer or winter!